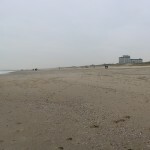 How does a sandy beach naturally restore after a storm event? 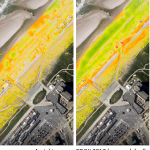 Invaluable information on this process is provided by a highly temporal (hourly) time series of 3D point cloud data acquired over several months at the beach of Kijkduin (NL). The permanent LiDAR system is operated by a team of TU Delft researchers in the frame of the CoastScan project under lead of Sander Vos, Roderik Lindenbergh, and Sierd de Vries. As part of the research in the Auto3Dscapes project, PhD student Katharina Anders of the 3DGeo Research Group is currently staying with the Optical Laser and Remote Sensing Research Group of Roderik Lindenbergh at TU Delft. Main objective is the development of methods, to quantify the 3D deformation over time from the 4D data and characterize the spatially and temporally variable morphological change processes on the beach. This PhD research is funded by the Heidelberg Graduate School of Mathematical and Computational Methods for the Sciences (HGS MathComp), founded by DFG grant GSC 220 in the German Universities Excellence Initiative.